I’m surprised we don’t see more KTMs on the custom scene. Maybe it’s because the Austrian bikes offer great performance straight out of the box, and a love-it-or-hate-it style that’s hard to tweak. 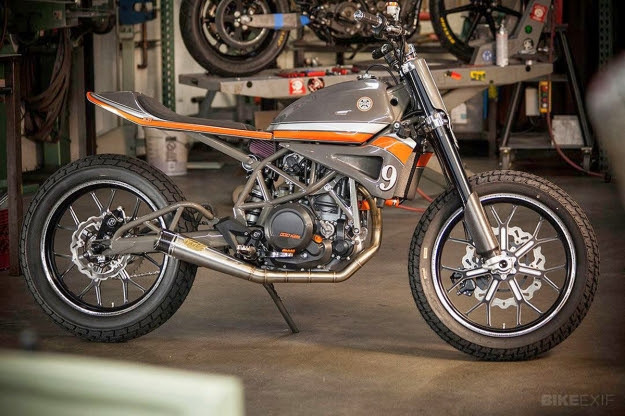 Roland Sands is a fan of the brand, and also one of the few customizers brave enough to tear down a KTM. In this case, it’s an Enduro 690 given a dash of tracker style. This is Sands’ second tilt at the 690; regular readers will remember his café’d version from a few months ago. The RSD tracker is lithe and angular, with an almost insect-like grace. It’s a pretty heavy-duty build, with a new subframe and swingarm custom-fabricated in airfoil-shaped tubing that matches the existing frame of the bike. The bodywork is also hand-formed, this time in aluminum, with sublime paint from Airtrix. The exhaust system, with ten sections of pipe neatly bent and welded together, terminates in a stubby, low-slung muffler. The bike rolls on RSD’s own Del Mar wheels in ‘Contrast Ops’ finish—a classic dirt track-inspired design. (It’s also the lightest wheel in the RSD catalog.) The Goodyear/Dunlop flat track rubber is equally eye-catching, and a Performance Machine brake system hauls the whole shebang to a stop. With warm grey-brown powder on the frame and anodizing from show bike specialists Sport Chrome, the KTM tracker looks a million dollars. Hit the RSD website for more shots—and a video showing the making (and attempted breaking) of the bike. 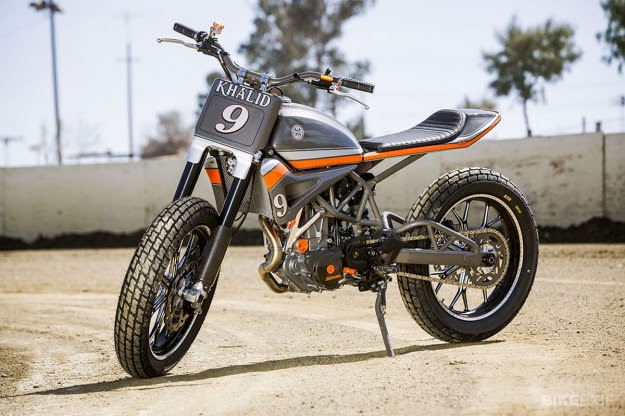 The post KTM Tracker by Roland Sands appeared first on Bike EXIF. The new Indian Motorcycles, Star Bolt, Suzuki V-Strom 1000 and Yamaha FZ-09 we showed you in recent issues were just appetizers; here’s the main course for 2014. BMW has been hard on the gas launching new-for-2014 models, including the F 800 GS Adventure (Rider, October 2013), R 1200 GS Adventure and R nineT retro bike (January 2014). Just in case its top-line K 1600 GTL touring bike isn’t luxurious enough for you, BMW has just introduced the K 1600 GTL Exclusive. 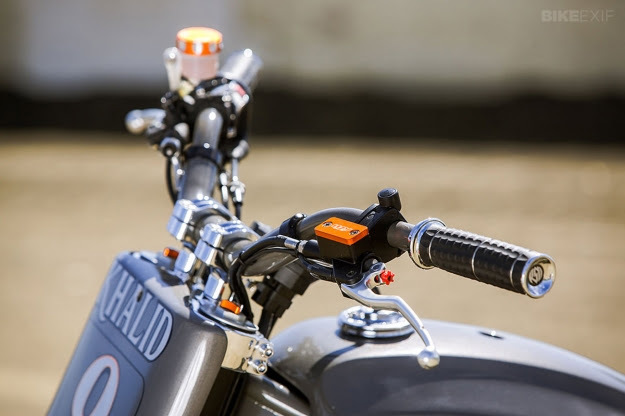 It takes the bike’s convenience and luxury to the extreme with standard features such as Keyless Ride, which enables a new pushbutton ignition, steering lock, fuel filler flap and central locking when the transponder/key in your pocket is near the bike—no need to use a key for any of those things. As the transponder moves out of range, the Exclusive’s anti-theft system is armed automatically and the steering is locked. More GTL Exclusive-model features include Hill Start Control, which holds the bike in position on hills until you pull away, without having to keep the brakes applied. The passenger seat is larger, and armrests and a heated backrest are standard. For appearance’s sake, a film antenna embedded in the trunk lid eliminates the need for an antenna rod, and the bike is finished in four coats of special Mineral White Metallic high-gloss paint blended with Magnesium Metallic Matte. Many optional features for the regular K 1600 GTL are standard on the Exclusive, including traction control and Electronic Suspension Adjustment II (ESA II). New LED daytime running lights switch on automatically in the daytime, and a pair of LED auxiliary lights help illuminate the road ahead. With the new liquid-cooled BMW R 1200 GS selling like candy canes at Christmas, it was only a matter of time before the lighter, more powerful twin made its way into other R-series models, like the R 1200 RT sport tourer. The RT’s new engine has the same displacement as before (1,170cc), but its output is much higher—a claimed 125 horsepower at 7,750 rpm and 92 lb-ft of torque at 6,500 rpm. For sport-touring duty, the centrifugal masses of both the crankshaft and the stator have been increased to help the engine run more smoothly. The 6-speed transmission has a taller secondary transmission ratio to reduce engine rpm, and the hydraulically actuated wet clutch has a slipper function. Although the Alps-bred R 1200 RT has always been a nimble machine, for 2014 the chassis has been revised to complement the higher-output engine. The new frame has a continuous design that increases rigidity, which BMW says improves both responsiveness and feedback, and new 10-spoke cast aluminum wheels add to the bike’s more dynamic look. Bodywork has also been redesigned, giving the R 1200 RT an appearance that splits the difference between the R 1200 GS and the K 1600 GT/GTL. The 2014 BMW R 1200 RT comes standard with two riding modes (Rain and Road), as well as Automatic Stability Control (ASC). Optional Riding Mode Pro adds a Dynamic riding mode, and the new Hill Start Control function. Other options include Gear Shift Assistant Pro for clutchless upshifts and downshifts, as well as Dynamic ESA (Electronic Suspension Adjustment). The 2014 BMW R 1200 RT will be available in three colors: Quartz Blue Metallic, Callisto Grey Metallic Matt and Ebony Metallic. After quickly climbing to the top of the liter-class sportbike heap with its 193-horsepower, in-line four S 1000 RR, now BMW has unveiled a naked version called the S 1000 R. Less bodywork, an upright handlebar and more low-to-midrange grunt (but less top-end power) make the S 1000 R better suited for the street. Redline has been reduced by 2,000 rpm, and maximum horsepower has been lowered to 160 at 11,000 rpm. Peak torque is the same as the RR, but the 83 lb-ft maximum is reached at 9,250 rpm instead of 9,750 rpm. Up to 7,500 rpm, the S 1000 R makes about 7 lb-ft more torque than the S 1000 RR. That much giddy-up on a bike that weighs a claimed 456 pounds wet should provide enough excitement to wake the dead. As with many high-performance motorcycles today, the S 1000 R is equipped with electronic riding aids including two riding modes (Rain and Road) and traction control. Dynamic Traction Control (DTC), incorporating two additional riding modes (Dynamic and Dynamic Pro) and making use of a lean-angle sensor, is optional. Optional Dynamic Damping Control (DDC) provides electronic control of suspension damping that continuously adapts to riding conditions. The 2014 S 1000 R will be available in three colors: Racing Red Non-metallic, Frozen Dark Blue Metallic and Light White Non-metallic. Pricing and availability on all three new BMWs are TBD. The RT’s cockpit has been completely revamped with new analog dials and a digital menu similar to the K 1600 GTL’s. To kick off the Monster line’s third decade, Ducati has introduced the biggest and baddest beasts yet—the Monster 1200 and Monster 1200 S. Replacing the previous heavyweight in the Monster family, the 1100EVO, the new models are powered by the 1,198cc liquid-cooled, desmodromic Testastretta 11˚ L-twin found in the Diavel power cruiser and Multistrada adventure tourer. In the Monster 1200, it makes a claimed 135 horsepower at 8,750 rpm and 87 lb-ft of torque at 7,250 rpm, while the Monster 1200 S kicks it up a notch with 145 horsepower and 92 lb-ft of torque. Three Ducati Riding Modes (Sport, Touring and Urban), eight levels of Ducati Traction Control and three levels of ABS allow the new Monsters to be adapted to a wide range of conditions. To enhance stability on such a powerful, lightweight bike (461 pounds wet, claimed), the wheelbase has been increased by 2.4 inches compared to the Monster EVO1100. And to enhance riding comfort, the handlebar is 1.6 inches higher and 1.6 inches closer to the rider than on the previous model. Seat height is now adjustable and can be set at either 30.9 or 31.9 inches; an accessory low seat reduces height to 29.3 inches. Ducati will also offer a “Supermid” version of the ferocious 1199 Panigale superbike in 2014 called the 899 Panigale. Although still massively oversquare, the 899 version of the Superquadro L-twin has a smaller bore (100.0mm) and shorter stroke (57.2mm). It displaces 898cc and generates 148 horsepower and 73 lb-ft of torque at the crank (claimed). Claimed wet weight is 425.5 pounds vs. 414.5 pounds on the 1199. Yes, you read that right. The 899 has a conventional (double-sided) swingarm, whereas the 1199’s is single-sided. Part of the weight difference may also be due to different suspension components and tires. Styling is all but identical to the 1199, and the level of specification is very high—Brembo Monobloc calipers, Showa Big Piston Fork, Sachs shock, Pirelli Diablo Rosso Corsa tires. The 899 Panigale will be available in traditional Ducati Red ($14,995) or Arctic White ($15,295). Closely following the auspicious re-launch of Harley’s Touring family under the Rushmore banner (November 2014), Harley-Davidson will introduce its first all-new platform and sixth model family next year with Street 750 and Street 500 motorcycles based on a new liquid-cooled Revolution X engine. With low price tags and seat heights, the Street line is aimed at young-adult urban riders looking for a nimble bike with some room for customization. The Revolution X engine is a 60-degree, liquid-cooled unit V-twin of either 494cc or 749cc and has SOHC four-valve heads, a counterbalancer to reduce vibration, a 6-speed transmission and belt final drive. It’s housed in a new chassis with a 25.4-inch seat height, wide handlebar and mid-mount controls, and both bikes are said to weigh 480 pounds with the 3.5-gallon tank full. Wheels are 17 inches in front and 15 in the rear, with 100- and 140-series tires respectively. The blacked-out styling takes some cues from the V-Rod line, especially the rear fender and radiator. Machined cylinder fins and wheel spokes set the Street 750 apart from the all blacked-out 500. In addition to expanding Harley’s lineup to appeal to a broader range of riders, the Street 500 will fill the gap in Harley’s Riding Academy training program left by the departed Buell Blast. Both the Street 500 and 750 will also be sold in other countries where its larger models might cost more, incur tariffs or be license restricted. In fact, Street models for sale in India, Italy, Spain and Portugal will be made in Harley-Davidson’s Bawal, India, factory alongside other bikes made strictly for consumption in that country since the factory opened in 2011. All motorcycles for North America, including the new Street line, are made in Harley’s factories in York, Pennsylvania, or Kansas City, Missouri. The Street 500 will carry a MSRP of $6,700 and the Street 750 will start at $7,500. You can have any color you want as long as it’s black. Machined cylinder fins and wheel spokes set the Street 750 (shown) apart from the 500. Both bikes take some styling cues from the V-Rod. Machined cylinder fins and wheel spokes set the Street 750 apart from the 500 (shown). Both bikes take some styling cues from the V-Rod. Honda has introduced so many new models lately we couldn’t fit our coverage of the new CTX1300 alongside the Valkyrie in the February 2014 issue. These two bikes join the CTX700/N, Grom and CRF250L as all-new 2014 Honda motorcycles. Like the CTX700s, the larger CTX1300 offers new and returning riders a low seat, easy handling and a torquey engine with smooth, seamless power—essentially a cruiser with some modern styling and technology. Styled similarly to the faired CTX700 with the addition of integrated saddlebags, the new CTX1300 is powered by a 1,261cc, 90-degree V-4 that shares its architecture with the venerable liquid-cooled, fuel-injected ST1300 sport tourer, but has new pistons, different gearing in the 5-speed box and a new 4-2-2 exhaust system. Honda says it makes significantly more torque than the ST1300 as a result of the updates. The V-4 is also mounted longitudinally in the CTX1300’s steel double-cradle frame, and power gets to the wide 200-series rear tire via a shaft final drive system designed specifically for the bike. Key to the big CTX1300’s appeal is its relaxed ergonomics, which combine a low seat height of 29.1 inches with wide, comfortable-looking seats for rider and passenger, a wide pullback handlebar and mid-mount footpegs. An underseat fuel tank contributes to its potentially nimble handling by lowering the bike’s CG, though we’ll have to wait for our first ride to see how the 724-pound (claimed curb weight) machine gets along with that fat 200-series rear tire. Both a top trunk and centerstand will be on the options list, as well as heated grips and a taller replacement for the stock shorty windscreen. Stepping up to the blacked-out CTX1300 Deluxe model will net the rider traction control, ABS, self-canceling turn signals and a contemporary sound system with Bluetooth connectivity. The Deluxe equipment is expected to add $1,500-$2,000 to the CTX1300’s price tag, which was still TBD at this writing. Colors are Candy Red, Metallic Black and Gray Blue Metallic. 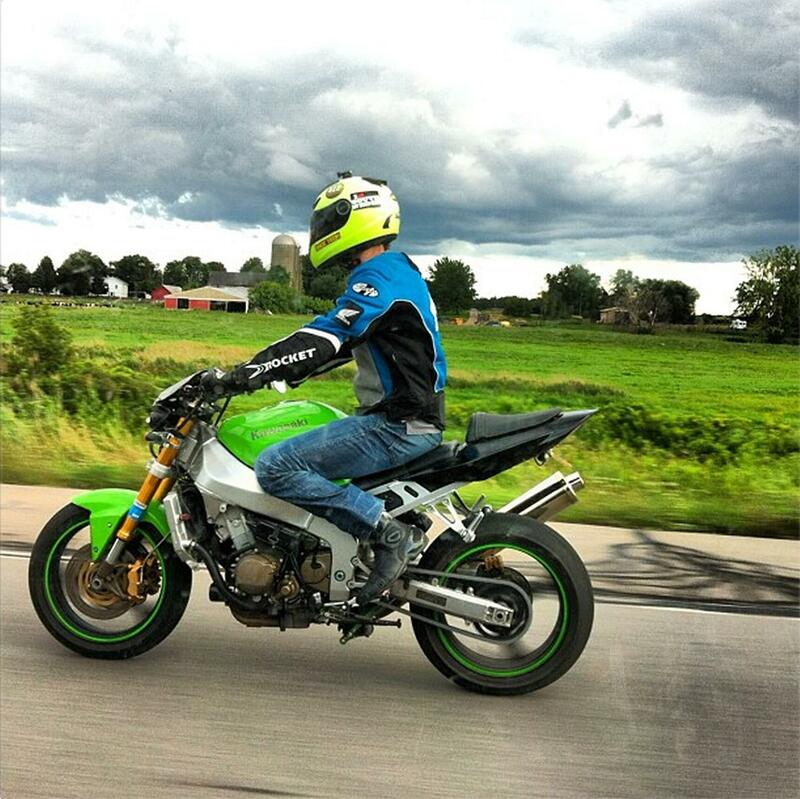 Up-spec sportbikes are popular because they offer higher-quality components in one package that is less expensive than buying those items individually. The all-new CBR1000RR SP features fully adjustable Öhlins front and rear suspension, plus Brembo front brakes and Pirelli Diablo Supercorsa SC high-performance tires. A lightweight subframe lowers the center of gravity and a new rear single-seat cowl shaves additional weight. The CBR’s 999cc in-line four puts out more power and torque thanks to a new cylinder head, intake tract and exhaust system, along with high-performance pistons and connecting rods. The SP’s riding position is now more track-oriented and a bubble windscreen creates a larger still-air pocket for the rider. Available in a special White/Red/Blue paint scheme; pricing is TBD. The 2014 CBR1000RR receives the same engine changes, ergonomics revision (new handlebars and relocated footpegs) and bubble windscreen as the SP model. Price is TBD. CTX1300 Deluxe includes a sound system with front speakers and Bluetooth connectivity. Though the modern Z1000 has never had trouble getting noticed, for 2014 Kawasaki has made it even more eye-catching. From its tiny LED headlights to its tapered tail section, the new Z1000 looks compact and aggressive. Kawasaki has embraced a new styling language that it calls “Sugomi,” which it says gives the bike the appearance of a crouching predator and influences such details as the special “Z” logo ignition keys, machined aluminum steering stem bolt and textured “Z” motif seat cover. Beyond styling, the Z1000’s 1,043cc, DOHC, liquid-cooled, 16-valve engine has received many of the same updates as the 2014 Kawasaki Ninja 1000 (January 2014) to boost performance in the upper registers and improve sound, feel and throttle response. Based on the Ninja ZX-10R’s chassis, the Z1000’s aluminum frame curves over the engine, cradling it from above and bolting solidly to it in three places, with a rubber-backed fourth mount provided for added vibration isolation and torsional rigidity. The main frame and swingarm pivot pieces are cast as a single unit with minimal welds, and the new subframe tapers to a very shallow cross-section at the rear. Suspension is handled by a new fully adjustable 41mm inverted SFF-BP (Separate Function Fork–Big Piston) fork up front and a preload- and rebound-adjustable horizontal back-link shock in the rear. New one-piece monobloc radial-mount front brake calipers with a race-spec radial pump master cylinder are said to improve power and feel, and ABS is now standard. The 2014 Z1000 will be offered in Golden Blazed Green or Metallic Graphite Gray for $11,999. Look for a test of the Z1000 in the next issue. There are motorcycles that push the boundaries; others simply relocate them. The new KTM Super Duke 1290 R blasts them to pieces. This is KTM’s third all-new entry for 2014 following the launch of the 1190 Adventure R and 1190 Adventure (May 2013), which we hope to have a full test of very soon. 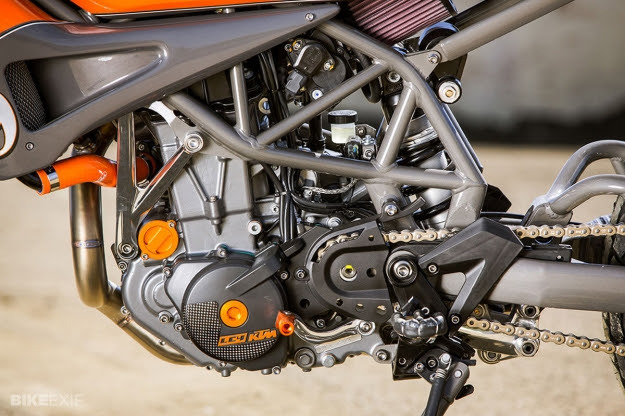 At a claimed 417 pounds dry with 180 horsepower at the crankshaft, the Super Duke 1290 R is a streetfighting brawler trespassing in hyper-sportbike territory. And why not—it’s 75-degree, DOHC LC8 V-twin is based upon the KTM 1190 RC8 R superbike engine. Displacement has been increased to 1,301cc from 1,195cc, and throttle bodies enlarged to 56mm from 52mm to get that insane power, and the engine is bolted into a lightweight chrome-moly steel trellis frame, with a fully adjustable WP 48mm male-slider fork and single shock on a single-sided swingarm. 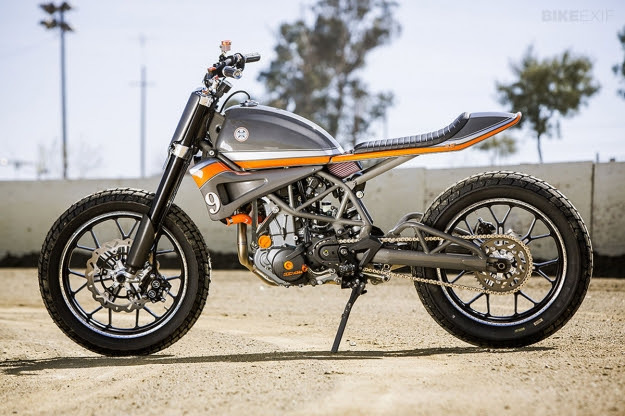 Throttle-by-wire and a host of electronic assistance systems help keep this high flyer on the ground, from disengageable ABS that has a “Supermoto” mode (read: big, long rear-wheel slides); to multi-staged, lean-angle-sensing traction control and riding modes. At the same time, dual ignition increases fuel economy and smoothens power delivery in the lower rev range. Ergonomics are said to be sporty but still comfortable for long rides. KTM will offer several optional packages for the Super Duke 1290 R to trim it out for racing, touring or simply more style. It will come in Matte Black or Orange colors; price is $16,999. Right after announcing updates to the Bonneville, Thruxton and Scrambler for 2014, Triumph Motorcycles has introduced three new cruiser models, the Thunderbird LT, Thunderbird Commander and America LT. Both Thunderbird models are powered by the Thunderbird Storm’s big-bore 1,699cc parallel twin rather than the base-model Thunderbird’s 1,597cc mill. The liquid-cooled, fuel-injected, 8-valve, DOHC engine has an uneven 270-degree firing interval and a long-stroke design (107.1mm bore x 94.3mm stroke) that produces a claimed 93 horsepower at 5,400 rpm and 111 lb-ft of torque at 3,550 rpm. An all-new chassis is said to improve rider/passenger comfort by allowing a larger seating area and reshaped seat. A pullback handlebar allows a more relaxed riding position, and steering geometry has been revised and the front wheel is now wider for improved handling, carrying a new 140/75-17 front tire to accompany the existing 200/50-17 rear tire. Triumph partnered with Avon Tyres to develop the world’s first radial whitewall motorcycle tires for the Thunderbird LT, which offer better performance than bias-ply tires. The new 2014 Thunderbird LT (Light Touring) has a quick-release windshield and removable leather saddlebags. Driving lamps, chrome floorboards with replaceable skid plates, an adjustable chrome heel/toe gear lever and wide wire-spoke wheels round out the touring package. The 2014 Triumph Thunderbird LT will be available in spring 2014, with two color options: Caspian Blue/Crystal White or Lava Red/Phantom Black. Like the Storm, the Thunderbird Commander has Triumph’s signature twin headlights, but it stands apart with a polished top yoke, polished stainless steel fork shrouds and less upswept chrome exhausts. The 2014 Triumph Thunderbird Commander will be available in one of two paint schemes: Lava Red/Crimson Sunset or Phantom Black/Storm Grey. Pricing for both new Thunderbirds is TBD. Based on the existing Triumph America with its air-cooled, fuel-injected, DOHC 865cc parallel twin, the new America LT adds a tall windshield, a pullback handlebar, leather saddlebags, floorboards and a heel-toe shifter. The 2014 America LT is available now in two-tone Pacific Blue/Sapphire Blue with an MSRP of $9,499. Tragic news just broke from the Baja 1000. 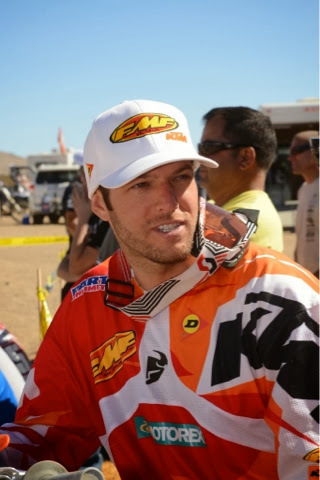 It is being reported that off-road racing legend Kurt Caselli crashed after possibly hitting an animal. He later died from severe head trauma after being medevaced to the nearest hospital. Kurt was just 30 years old. While any death in the dirt bike world hits us all hard, the death of Kurt Caselli will be felt worldwide. Kurt was nothing short of a legend on two wheels and a friend to anyone that he came in contact with. Our thoughts and prayers are with all of Kurt’s friends and family tonight. RIP Kurt Caselli. You will be remembered and sorely missed. We will report more when further news becomes available. Read Official KTM Press Release>>>. Per Chris Estrada of Motorsports Talk, the fatal accident occurred near the end of the 833-mile Baja 1000 in Baja California, Mexico. Caselli's motorcycle reportedly hit an animal 796 miles into the race, which caused him to suffer significant head injuries. He was airlifted to the hospital where he was ultimately pronounced dead. Caselli was an elite rider for KTM Racing, and he was a three-time Hare & Hounds champion and winner of the Desafio Ruta 40 Rally, according to Ballaban. Hugely shocked and saddened to hear of the death of Kurt Caselli as the result of a crash while riding in the Baja 1000. A huge loss to his family, team and to our sport. Kurt was a wonderful competitor and an all round top guy. More when we have all the details from our team in the USA statement. Kurt Caselli was one of American desert racing’s finest champions, and his early and untimely death is a major blow to the hearts and minds of all of us who knew him or knew of him. Caselli was a gracious competitor, a team leader and a fan favorite. His love for motorcycling showed through in everything he did, whether he was leading his fellow racers as the U.S. team captain for the International Six Days Enduro or signing autographs for a young fan. On behalf of the AMA Board of Directors, our staff and AMA members everywhere, we offer our condolences to the family of Kurt Caselli and thank them for sharing with us one of the sport’s finest racers and greatest men. The annual EICMA International Motorcycle Exhibition took place in Milan, Italy last week with the world’s major motorcycle manufacturers unveiling their new and updated models – many of which are destined to make their UK debut at Motorcycle Live 2013 from 23 November to 1 December. As the EICMA media days unfolded on Monday and Tuesday, Ducati, Honda, Yamaha, Triumph, Kawasaki, BMW Motorrad, KTM, Piaggio Group and Suzuki each took turns to reveal to their new machinery. Italian giant Ducati kicked off proceedings on its home turf with the debut of the limited edition 1199 Superleggera, as well as the third generation of the iconic Ducati Monster, the Monster 1200. Yamaha took the opportunity to launch two new additions to its ‘Masters of Torque’ range: the MT-09 Street Rally and the MT-07 – a naked 689cc twin-cylinder model which visitors to Motorcycle Live have the chance to win. For details of the competition visit www.motorcyclelive.co.uk/competitions. UK manufacturer Triumph unveiled five new models for 2014 with the introduction of the Thunderbird Commander, Commander LT, America, America LT and Speedmaster, while a Tiger 800XC special edition was also unveiled. BMW Motorrad launched two new 2014 models: the R 1200 RT tourer, powered by the liquid-cooled boxer engine, and the S 1000 R high-performance roadster. It also showcased an updated R 1200 GS Adventure and the C evolution scooter. Two new Kawasaki machines were unveiled, representing important aspects of the Japanese brand’s approach to powered two wheelers. The latest Z1000 Supernaked is joined by the first Kawasaki scooter offering in the European market, the distinctive J300. Following the unveiling of the prototype last year, KTM launched the production 1290 Super Duke R, dubbed ‘The Beast’. Also joining the KTM line-up are the RC125 and RC390 supersport machines. Piaggio Groupwas next up with launches from three different brands, Vespa, Aprilia and Moto Guzzi. Vespa announced the return of the legendary Primavera model complete with an ultra-modern makeover, while Aprilia unveiled two new versions of the RSV4 – the R ABS and Factory ABS. Moto Guzzi meanwhile showcased a new total black colour option for the V7 Stone. Finally Suzuki showcased its most advanced adventure model ever, the V-Strom 1000, which features a new 1037cc V-Twin engine developed to deliver excellent low-mid range power. The majority of new machines revealed at EICMA, plus many, many more, will be on display at Motorcycle Live 2013. Other brands exhibiting include Harley-Davidson, Royal Enfield and Victory, as well as UK-based firm Norton. EICMA_2013 (9) Specialist brands such as AJP, CCM, GasGas, Husqvarna, Metisse, Morgan, WatsonianSquire, WK Bikes, Quadzilla and electric motorcycle marque Kuberg will all appear, while Herald Motor Company, Indian Motorcycles, Lifan and ShineRay will make their Motorcycle Live debut. 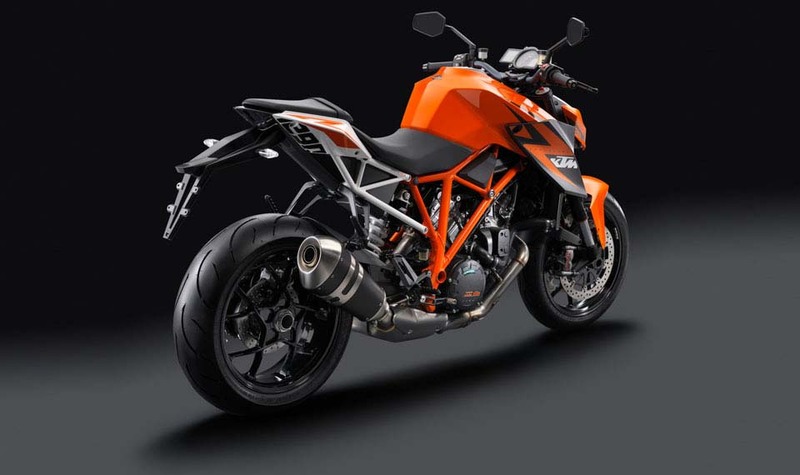 Judging from how the KTM 1290 Super Duke R stacks up against its competition (like the Aprilia Tuono V4 R APRC ABS, BMW S1000R, and Ducati Monster 1200 S), the Austrian’s were right in calling the new Duke “The Beast” in their pre-launch marketing. 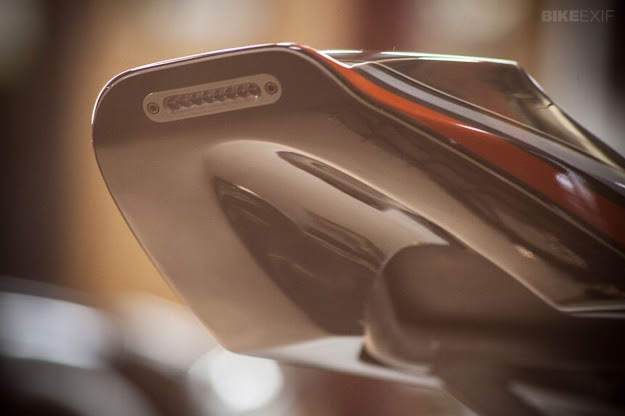 With 180hp coming from its 1,301cc v-twin engine, and 106 lbs•ft of torque (74 of which start at just 2,500 rpm), KTM has built a road-eating monster in the new Super Duke R.
Taming that beast is no easy task, though luckily the KTM 1290 Super Duke R is one of the Austrian company’s first motorcycles to get traction control. But as our friend Iwan learned at the international press launch in Spain, the Super Duke R still packs quite the punch. KTM’s tame motorcycle racer, and development rider for the Super Duke R, Jeremy McWilliams was on-hand for the press launch as well. Unfortunately for McWilliams though, there appears to be something wrong with his race-spec Duke, as the front wheel has trouble staying attached to the ground. He should probably have the boys take a look at it.